Listing all features of our software would be an impossible task. Although the list below is by no means exhaustive, it provides a high-level overview of the BioNumerics functionality. Simply click on a feature to learn more! Multiple alignments of patterns can be obtained by conducting a global band matching, a process that subdivides all bands from a set of patterns into band classes. 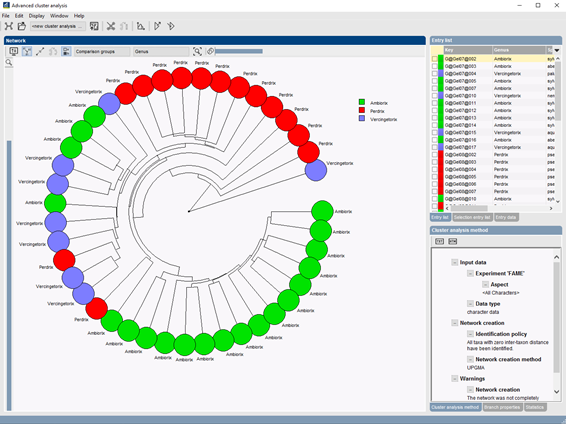 Band matching has the advantage that data matrices can be generated containing the band classes as characters, which can be applied in a number of phylogenetic and statistical techniques that require a character table as input. Global band matching is calculated in the Comparison window from any selection of patterns. features a completely new tool for processing capillary sequencer fingerprints, i.e. electropherograms obtained from fragment analysis on multichannel capillary electrophoresis (CE) equipment. Processing and normalization of gel image files consists of 4 easy steps: Strips, Curves, Normalization, and Bands. The whole process is contained in a powerful tab-based window, allowing easy access to re-edit the processing at any stage without losing any editing in another step. Band-search algorithms with adjustable sensitivity for shoulder and double-band finding. Possibility to find and mark uncertain bands/peaks. Quantification of molecular sizes or any other metric unit using linear, logarithmic, combined logarithmic-third power regression, cubic spline or pole functions. Accurate expression of protein or nucleic acid quantities or concentrations based on cubic spline regression using known calibration peaks. Comparative quantification of bands/peaks between groups of patterns. Comprehensive set of user and security tools, including creation of Users with logins and passwords and User Groups defining specific privileges. Control password timeout and strength, user activity logging and data input consistency. Possibility to define access privileges for each individual database object. Create, Modify, Delete, Sign, Restore, Lock and Unlock privileges can be granted to specific users. ODBC connection string can optionally be encrypted to enhance database security. To ensure even higher security, the entire database connection and mapping settings file can be encrypted as well.